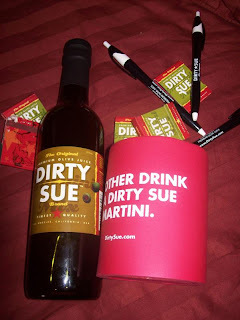 Dirty Sue sent me some of their olive juice for review. It is used for dirty martinis. I actually have never had a martini before but I love olives so I knew that I would like this. Here is what the company has to say: Dirty Sue was created by bartenders for bartenders and home enthusiasts. The finest first quality olives from the Sevilla region of Spain are the heart of this proprietary olive juice product. Dirty Sue is twice filtered brine (olive juice) made from premium olives and comes in an attractive bottle made to be stocked alongside other bar staples such as Rose's Lime Juice and grenadine, or in the fridge at home. Dirty Sue olive juice mix is the perfect complement to your favorite gin or vodka when you are ready to enjoy a classic dirty martini. I think that this product was great! It was nice and salty and sour! I would even use it in a recipe. Maybe in some pasta salad or something? My husband would not come near this because he does not like olives. More for me! Thanks Dirty Sue for the awesome martini mixer!